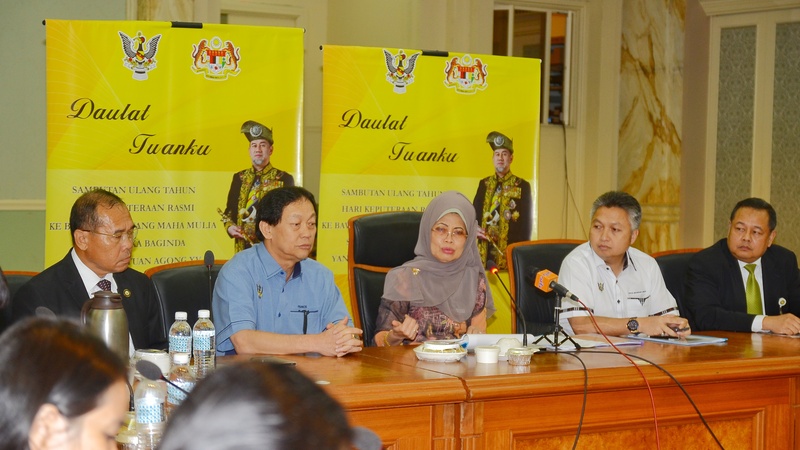 KUCHING: The town of Sri Aman will be hosting the state-level birthday celebration of the 15th Yang di-Pertuan Agong, Sultan Muhammad V on September 8 until 9, said Minister for Welfare, Community Well-being, Women, Family and Childhood Development Dato Sri Fatimah Abdullah. The event will begin with a thanksgiving prayer on September 8 at Masjid Bandar Sri Aman at 6.30pm. The Head of State, Tun Pehin Sri Abdul Taib Mahmud and his wife, Toh Puan Datuk Patinggi Ragad Kurdi Taib are expected to grace the event. They will be joined by Chief Minister, Datuk Patinggi (Dr) Abang Johari Tun Openg, and wife, Datin Patinggi Dato Juma’ani Tun Tuanku Bujang and State Ministers who will join more than 1,000 locals for the prayer. Among the activities at the mosque are Fardhu Maghrib and Isya prayers, Surah Yassin reading, Zikir Marhaban and thanksgiving prayers. “On the next day, there will be a high tea reception at Seri Simanggang Hotel to be graced by the Head of State. “The Chief Minister and his cabinet ministers along with their spouses are invited to the reception. “Upon arrival, Tun Taib will be accorded a traditional welcome and special presentations to be coordinated by the Ministry of Tourism, Arts, Culture, Youth and Sports,” said Fatimah during a press conference at Wisma Bapa Malaysia in Petra Jaya here on Tuesday. She added that there will also be a cake cutting ceremony and the Governor will be presenting hampers and cash donations to the underprivileged. “There will also be a presentation of assistance to fire victims from Lingga, Engkilili and Pantu. The assistance involves 22 doors of longhouse in Pantu, seven doors of longhouse in Engkilili and a house in Lingga. Each door of the house will receive RM5,000 from State Welfare Department,” she affirmed. After the high tea, Tun Taib will declare open the three-day pictorial exhibition titled Raja Kita centralising on the Yang di-Pertuan Agong which is organised by the State Information Department at the lobby of Seri Simanggang Hotel. “The exhibition will be open for public viewing from 2pm on September 9 and from 9am onwards on September 10 until 11. “It is a good opportunity for the public, especially students, to gain knowledge on our King by going to the exhibition which comprises more than 30 photos of our King. “The exhibition also features the traditions and customs of Istana Negara and the coronation ceremony,” she noted. Visitors also stand a chance to win attractive prizes by taking part in a quiz organised by the State Information Department. Sri Aman to host Agong’s birthday fete 0 out of 5 based on 0 ratings. 0 user reviews.